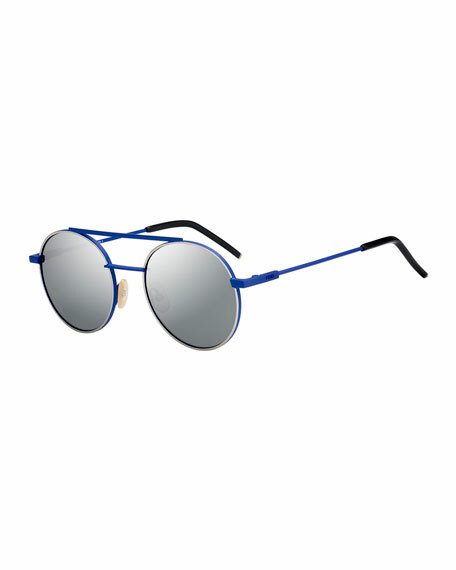 Persol "PO3159S" pilot sunglasses from the Reflex Edition. Two-tone "Vintage Celebration" acetate frames. Shiny golden metal brow bar. Meflecto® hinge at sides to ease temple pressure. All Persol eyewear is handmade in Italy since 1917 with the highest quality materials and technology. A NOVEL IDEA. The world's first folding sunglassesintroduced by Persol in the 60sare more relevant today than ever thanks to their flexibility, durability, and ingeniously packable design. Since 1917, all Persol eyewear is handmade in Italy with the highest quality materials and technology. For in-store inquiries, use sku #2185983. 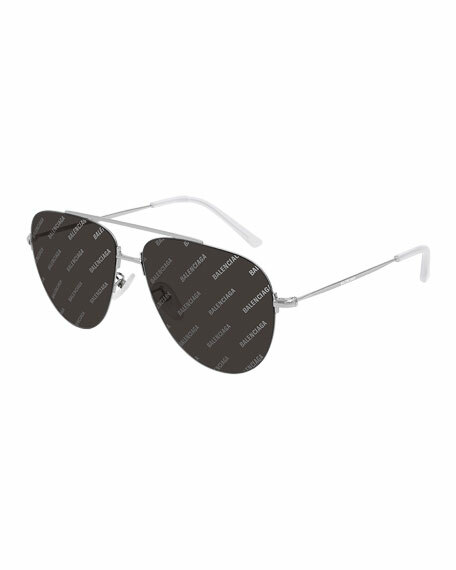 Balenciaga lightweight metal sunglasses in pilot aviator design. Eye/bridge/temple (mm): 59-13-150. Adjustable nose pads. Monochromatic lenses. Lenses featuring logo detail. Logo detail at temples. Temples with capped tips. 100% UV protection. Metal. Made in Italy. 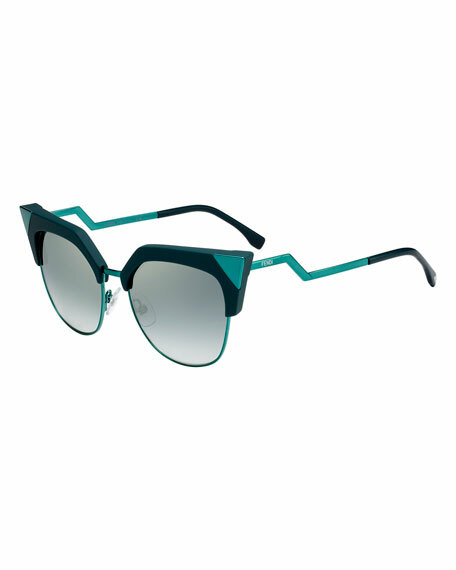 Fendi "Iridia" cat-eye sunglasses. Half-rim acetate/metal frames. Square mirrored lenses. Peaked crystal tip detail. Logo at temples. Stepped arms. Capped earpieces. 100% UVA/UVB protection. Made in Italy. Fendi round sunglasses in metal. Lens/bridge/temple (in mm): 52-20-145. Mirrored lenses. Double nose bridge. Straight brow bar. Adjustable nose pads. Logo detail at temples. Capped ear pieces. 100% UVA/UVB protection. Made in Italy. MCM "Schoolboy" square aviator sunglasses with strong angles. Thick acetate frames. Double metal bridge. Adjustable nose pads. Logo lettering at temple. 100% UV protection. Made in Italy.